I just returned from a planned two-week trip to Puerto Vallarta. Fun and sun in a tropical paradise, right? Not so much. Anyone who has spent the summer in Mexico will know what I'm talking about. This was no vacation. After months of planning and measuring and measuring and planning my shiny new Beta 43 finally shipped air freight from England bound for Guadalajara. I flew down on August 3rd to get there before it arrived. It was a sweltering 95 when I stepped off the plane -- like walking in to a sauna with no exit. The inside of the boat topped out over 100. This was going to be a long two weeks. Before we left Mexico back in April I hired Juan "the paper man" Arias to handle the import documentation and logistics, and Jack Tinsley of PV Marine Group to help me with the installation. Both were expecting me and ready to assist. Jack showed up the next day with a large fan in hand. That would prove to be the most important tool for this job, and my sanity. We had the old engine out in two days. My proud blue Perkins, removed and rebuilt twice in two years, a dependable old friend that saw us through many long days and nights at sea, the engine I was so reluctant to depart with after countless hours of maintenance and repairs, that freshly-painted diesel lay stripped down and in pieces on the dock. Seemed like such a sad end for a once important and reliable component of Jean Marie. It was depressing to look at it -- a painful reminder of lost time and wasted money. Still, I was sorry to see it go. The next day I received confirmation from Beta that the engine had arrived in Guadalajara and made arrangements with Juan to drive there and get it. Juan has a big red Ford pickup that he uses for jobs like this. He picked me up early the next morning for the long drive. It was a 5 to 6-hour trip one-way, but if all went well we could drive to Guadalajara, get it through Customs, and drive back in one day. Considering the reputation of government agencies in Mexico, we packed an overnight bag. That, as it turned out, was a wise choice. The engine was sitting in the Customs warehouse at the airport. Security policies prevented Juan from dealing with them directly so we had to hire a Customs agent to act as our middle man. I paid this guy a significant amount of cash in advance for the privilege of sitting around and waiting for him to do his job, which entailed driving a mile down the road to the airport and pushing some papers through to Customs officials. Juan had spent many days in advance getting all our documentation in order to avoid any hassles. And, as hard as they tried, they could find nothing wrong with our papers. Yet, for two long days, which included a hotel stay for us, they managed to delay the process. After a number of calls to the agent in PV, who then made a few motivational calls to the agent in Guadalajara, they finally ran out of excuses to hold my engine and loaded the crate in to the back of Juan's truck fifteen minutes before closing. It was after 7 by the time we got out of there and didn't get back to PV until 2 AM. I swore never to ship anything through Guadalajara again. The next day Juan showed up with the engine still in his truck. We unpacked it and dropped in on the dock using a big crane in the parking lot. It took two more hours to roll it down the dock on Jack's homemade dolly as we blew out three wheels trying to push it to the boat in the 100-degree heat. We made a plan to drop it in early the next day before the afternoon temps made it too difficult to work. The sight of the old Perkins, the unbearable heat, and the long to-do list combined to temper my excitement over the new engine. I suppose most people would show some enthusiasm over the purchase of a new diesel, but I was more concerned with getting it installed and running with minimal resistance. This was not going to be an easy repower. I'd done my homework and had Jack double-check my measurements, but the engine sits in a very tight space with little room for error. I knew we'd have a few issues to work out, but thought we could get it working without any show-stoppers. Of course, I was wrong. Considering my experience with engines to date, I should have known better. 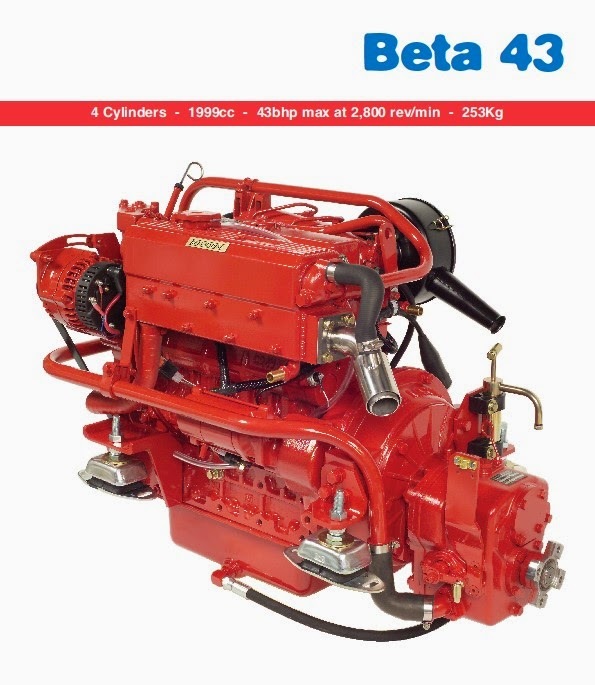 I ordered the Beta 43 with a ZF25 drop-down transmission. Beta Marine fabricated custom feet to fit the engine space according to the measurements I gave them as part of the ordering process. I spent a lot of time checking and double-checking the numbers to make sure we'd get it right the first time. So, you can imagine my disappointment when I realized we needed 3-inch blocks under the front mounts to get the shaft aligned. OK, no big deal. The engine will just sit a little higher than I expected. We can work around it, right? Wrong. The engine sits in a cabinet with limited space above. With the front mounts on blocks we were already at the top of the available space and still needed to move forward 3 inches. To make it work required installing it further aft and rebuilding the cabinet and floor in the back cabin -- not an ideal solution. This was a show-stopper. What followed was a lot of cursing and finger-pointing, with a good deal of self-loathing. I wasn't happy. Jack consoled me by pointing out the obvious: I was attempting to replace a 30-year-old engine inside a small cabinet that was built around it by cramming a new engine in the same space while communicating the process through email to the manufacturer 5,000 miles away. These things happen. Setbacks should be expected. I still wasn't happy. The next few days were filled with number-checking, picture-taking, and lots of back-and-forth emails with Beta engineers. They defended their ordering process and I defended my measurements. They also asked for a few new measurements, which I provided, but we still couldn't determine the source of the error. The only thing I knew with any degree of certainty was that the current configuration would not fit. However, if I replaced the transmission with an angled version and moved the feet back and down it would slide in to place. I knew what I had to do: send the transmission back and go home. So, that's what I did. The transmission is now sitting in a crate at Jack's house waiting for Juan to pick it up and deliver it to DHL for a return flight to the UK, and I'm sitting in our house in Bend enjoying the moderate climate of central Oregon. I'm still working with Beta Marine to determine what went wrong before placing a new order for an angled transmission and redesigned custom feet. I'll have to fly back to PV to finish the job when we get all that worked out. Hopefully, in cooler weather. More time, more money. But, eventually, Jean Marie will have a shiny new working engine. I've come too far to give up now.